Sasak Dishes: A Twist in Taste | What an Amazing World! As an attempt to immerse myself in the local culture every time I travel, sampling local dishes is always on my must-do list. Many times I was impressed and delighted with the richness and uniqueness of the flavors I tasted. Or lahm in Laos and shish kebab in Turkey were some that left me wanting for more. In my recent trip to Lombok with James, we embarked on yet another local culinary experience as we did on our previous journeys. 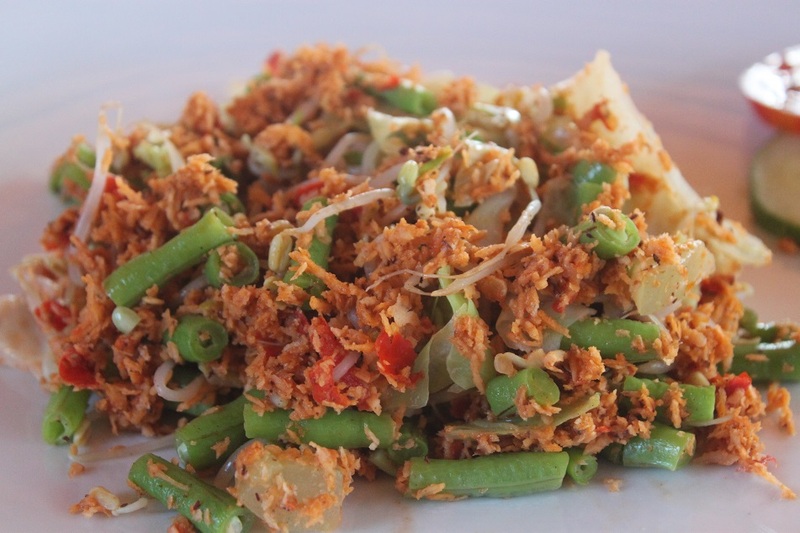 Lombok, which coincidentally means chili in Javanese, boasts some of the most widely-known local dishes in Indonesia due to its bold and exotic flavors. Sasak people – Lombok’s indigenous residents – are quite adventurous in mixing the spices in their cooking. “Where can we have local food in a restaurant nearby?” I asked Nella, the lady at the reception of our hotel. “We have it here,” she responded with a big smile on her face. 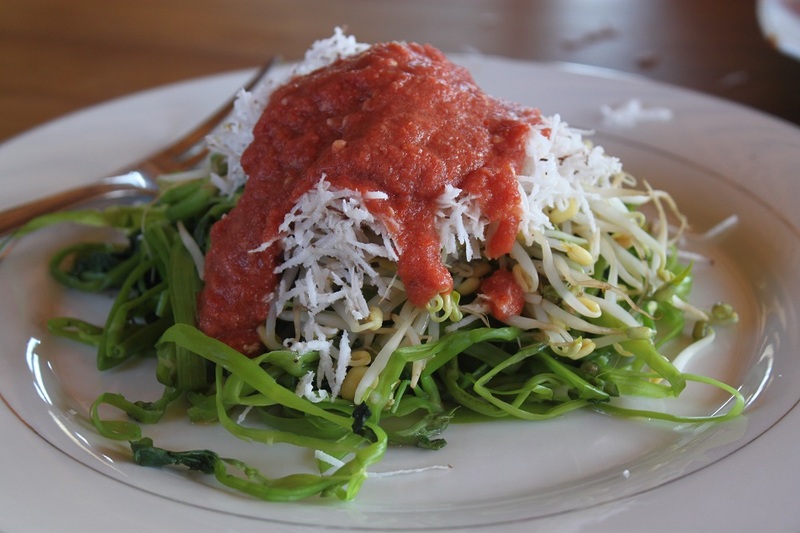 Pelecing kangkung, a local salad made from water spinach, beansprouts and grated coconut drenched in fiery and sour mixture of chili and raw tomato dressing, takes salad to a whole new level. 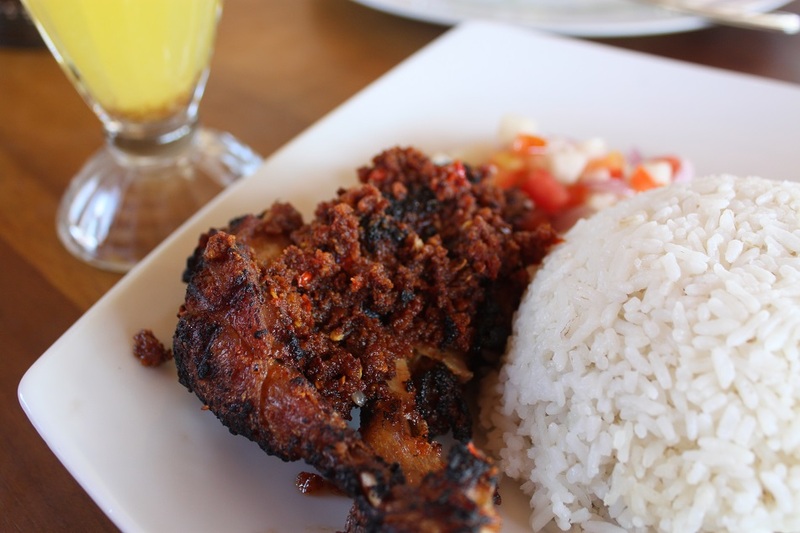 Meanwhile ayam taliwang, sweet grilled chicken in spicy coconut-based sauce, was so addictive that we had it almost every day, with gradually increasing levels of spiciness each day as I requested. Other tasty selections of Sasak cuisine include sate pusut ayam, minced chicken grilled on skewers and served with peanut sauce; pepes seafood, frutti di mare steamed in banana leaves; and urap-urap, a mixture of steamed long beans, beansprouts, cabbages, and grated coconut seasoned with chili, garlic, shallot, and galangal similar to Javanese urap. 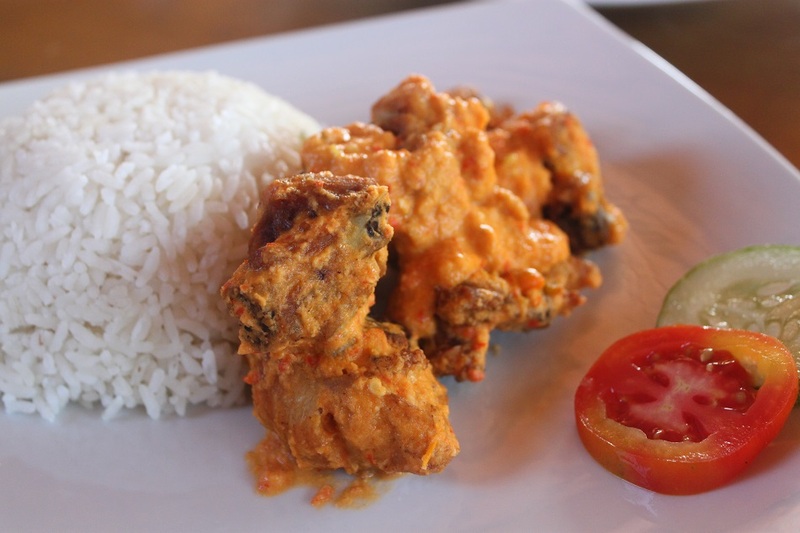 Third Moon Café, the restaurant at our hotel, proves to be a perfect place to sample authentic Sasak cusine, successfully making James put ayam taliwang on his list of favorite Indonesian dishes. Sasak dishes did not disappoint at all, but my journey to sample a wide array of traditional Indonesian food has only just begun. Just your description alone makes me so curious to try Sasak dishes one day – I suppose this is only available in Lombok and not everywhere in Indonesia. Haha, isn’t it Wira? I remember being pleasantly surprised by the concoction of raw tomatoes and chili. It was unlike anything I’ve tried before. baru tau ada pepes seafood kak, pedes? Pepes seafoodnya enak kok. Campuran antara ikan, udang, cumi. Pedesnya bisa disesuaikan sesuai permintaan. Ok then, I missed sate pusut and pepes seafood (Gosh, I’m drooling..). Ahh, that’s a great thing to know! Thanks a lot Badai! That’s one of the benefits of living in Jakarta, despite the traffic, since it’s the melting pot for Indonesians. 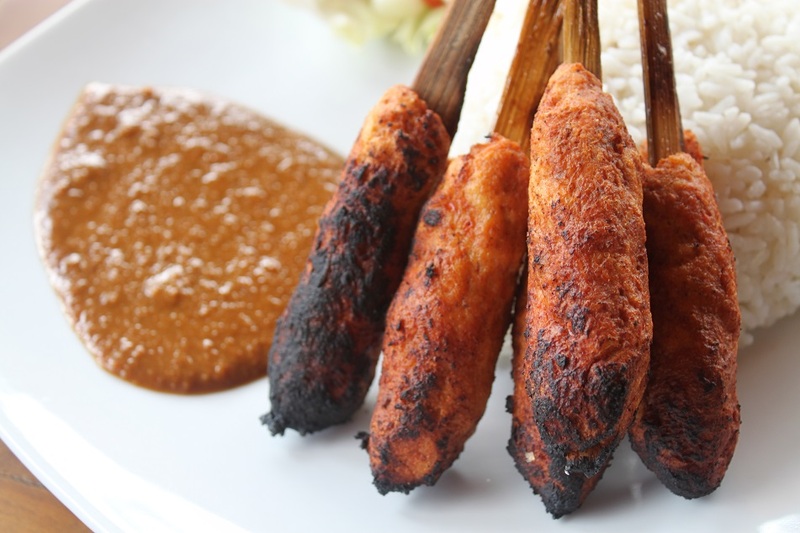 Chances are we’ll be able to find some authentic Indonesian dishes in the city. The food looks amazing and so Is your writing ! Wonderful ! Now I know where to find an authentic Lombok dishes in Jakarta, thanks to Badai. So the next time you come I know where to take you, among other places. I also noticed the different colors of our photos of the dishes. Yours look more warm. 🙂 Thanks James! Mouth watering dishes abetted by your photographs. Truly amazing. They did taste amazing, Sheenmeem. Thanks for your kind words! Amazing post! This is double the torture Bama, cruel of you – and James – to make us drool over stuff we can never find here 🙂 Shall have to hurry up shan’t I? Thanks Madhu! and I’m sorry for making you drool. 🙂 But I guess that’s indeed a calling for you to come to Indonesia sooner than later. Your words and photographs make me starving at this wee hour of the day! I love plecing kangkung and all those others! So yummy! Oops, sorry for that! 🙂 At first I was quite surprised by the taste of pelecing kangkung. But after a while I started to love it. In fact the next day I was craving the dish. Thanks Eki! Seriously, this looks and sounds amazing! They do Kelsey! When you happen to be in this part of the world, make sure not to miss those dishes! I’ll put it on my to-do list and write a review about it! 🙂 Thanks for the great read! Not only mouthwatering, but they also got us addicted to some level. Thanks Praveena! I… need…to… try this – NOW! Thanks for inspiring me to try new kinds of food today. 🙂 I love the idea of your blog! When I saw the dish I must say it didn’t look appealing at all. But when I tasted it, it was surprisingly fresh and rich in flavors at the same time. I will definitely try mohinga again in the future. Nice… something new to try if I ever see it anywhere. I’ve never heard of trancam before, so I just googled it. From the look of the dish it does bear some visual resemblances with urap. Thanks Terri! A week after coming back to Jakarta from Lombok, I found in other blog about other Sasak dishes that I haven’t tried. So many traditional dishes to try out there! 🙂 I hope you’ll get the chance to taste them for real Terri. All the best to you too! Yum! They all look scrumptious. I particularly dig that kangkung dish. It’s one of my favorite veggies (we call it kang kong in the Philippines). 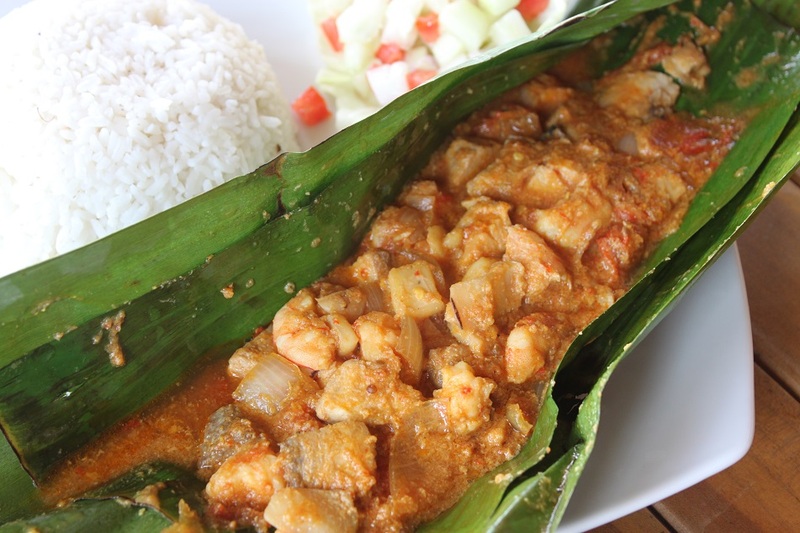 I’d love to try pepes seafood- I love anything wrapped in banana leaves. Thanks for another yummy culinary post! Lovely post! And the pictures make me hungry!